Many people across the country experience what is commonly known as a “double chin”. A double chin has a way of making people appear older or heavier than they actually are. If you are discouraged by how a double chin is affecting your appearance, Access Family Physicians now offers Kybella® as a double chin treatment, non-surgical body contouring solution to help redefine your profile. Access Family Physicians in Zionsville, Indiana is led by Dr. Sarah Lynley Rader who is determined to provide each and every patient with an unparalleled medical experience. We offer comprehensive care for patients of all ages and believe every patient deserves a personalized treatment to realize your unique needs. Contact us today to schedule your consultation to learn if Kybella® may be right for you! Kybella® is a specialized injectable formula for double chin removal that may already be resistant to a healthy lifestyle. This safe and effective non-surgical body contouring solution is approved by the FDA to help redefine your facial profile. 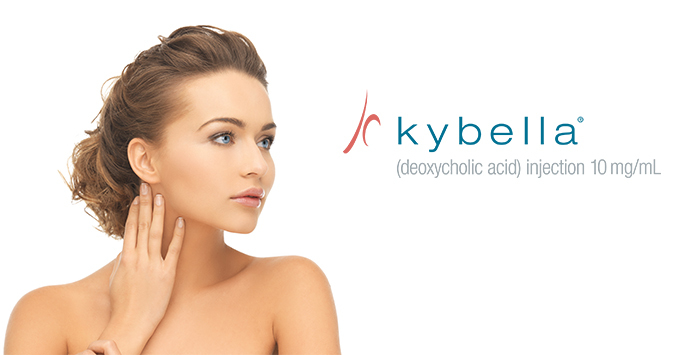 Comprised of deoxycholic acid– a molecule naturally found in the body to break down fat– Kybella® helps destroy fat cells to slim down the chin region. Once these fat cells are destroyed, they can no longer accumulate additional or future dietary fat, preventing the formation of a future fat and additional double chin treatment. One major benefit of Kybella® is that it does not require recipients to set aside downtime following their treatment. You may continue your schedule as soon as your leave from your appointment! Each patients has unique aesthetic needs and will require a personalized treatment plan to best accommodate them. Dr. Rader usually recommends receiving between 1-6 Kybella® treatments to achieve the best possible results of a slimmer facial profile. Many patients who have been sculpted through Kybella® have seen noticeable results after as little as 2 treatments! Ultimately, results will vary from person to person. Who is a good candidate for non-surgical body contouring with Kybella®? Kybella® may be an ideal treatment option for you if you are looking for a non-surgical, minimally invasive means of a double chin treatment. Don’t let a double chin keep you from feeling comfortable with your image. 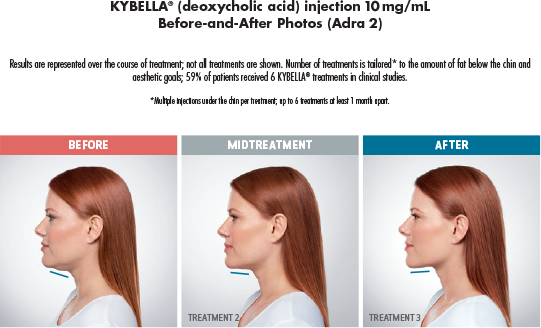 Contact us today to schedule your consultation to find out if Kybella® may be right for you!